Dan, who runs the Flattbush blog, has asked us if we wanted to do a piece on art, comics and then some, so.. Here we go! Espen: Ok, so I started to read comics before I could read words, and studied the origin and evolution of comics and its aesthetics when I did The Sequential Art doc. So I guess you can say I've seen a lot, but when I saw the art you did for Flattbush "Seize the Time" album, I thought: I've never seen this before. How did you develop that style and big-teeth character design? And were there any artists or comics which inspired you in any way? Riko: Thanks for the compliment and I am glad you liked that style. I came up with the big-teeth character design when I was in highschool during my senior year; that was in 1997. My english teacher gave us a project to make our own children's book. I don't remember the exact story but I think it was a weird one. My classmates didn't understand the story and neither did I, but they liked the drawings. After that project, I set aside the big-teeth style. 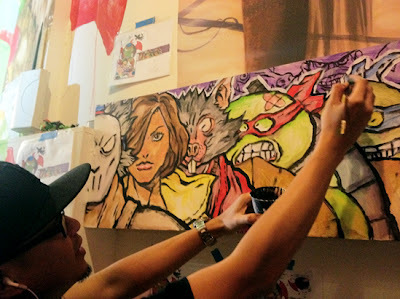 Then after I graduated from highschool, I would use the style occasionally for huge political murals, comic strips, etc. When I was recording the "Awit ng Pag-asa" ("Song of Hope" on the Seize the Time album), Bill Gould took notice of the Chairman Mao I painted on my guitar, with that big teeth style, and suggested that we should use that style on our album cover. If I am going to analyze where exactly I got the idea for the big teeth characters, I believe I unconsciously got them from watching too much Japanese super robots, the Teenage Mutant Ninja Turtles and playing a lot of Megaman video games. In comic books, my inspiration is vast and I still continue to fill up my bookshelves. The first batch of artists on my list would be Simon Bisley, Arthur Adams, Moebius, Kevin Eastman, John Romita Jr, etc. But the illustrator that really got me into buying comic books regularly would be Jim Lee's "Uncanny X-Men". I've seen a lot of illustrators in those days, but Jim Lee's style just blew me away and made me use my lunch money to buy and collect his works. A very expensive hobby and very difficult career to pursue, isn't it? Good thing I have Flattbush to express my frustration. Espen: Hehe.. Yes, breaking into comics is a tough one, I'm not sure there's so much to break into these days, but… Let's talk about tools and techniques. I know you love the brush, but you also vary your style and tools. What makes you use a specific tool for a specific project? Riko: It depends on the urgency of the project which tools I am going to use. If I have a lot of time to work on a piece, I will use pencil. I use a .3 pencil on a 5.5 x 8.5-inch paper. My originals are very small. The traditional way of drawing a comic book is usually 11x17 inches. I tried that method before but I think its a waste of time, paper and lead. Well, I think digital tools made me stick on my small method. The final printing in comic books is small anyway, and you can always blow them up if you want to make a poster sizes. Of course commissions can change all that. This is also the method I use when I paint huge political murals. I draw small and then project the line drawing on a big canvas or wall. But, if there is little time because of the urgency of the issue or the lack of immediate tools and space, I can always draw the lines and paint freehand. Usually in political murals, I use acrylic paint because the paint dries quick and it is water proof. You can use oil paint on the canvas but that is impractical and expensive. Usually oil is reserved for museums. Not only does it take too long to dry, it can also be a waste of materials because the fascist pigs can always grab your stuff and throw them away. So in my experience, the approach in political murals has to be fast, cheap and as big as possible to get that heroic shocking awe vibe. It is the message that is important and it's genuinely not for sale. But, if somebody want to buy the pieces for collection's sake, why not? The money can be used by the artists in need, (namely me, damn it and I've been doing this for too long). Espen: I know you skip pencils sometimes. You did this Ninja Turtles marker sketch which impressed Kevin Eastman. It must be somewhat liberating to just play with the marker instead of spending a day or two on a drawing with pencils, inks and so on. Riko: Hehehe…there you go, you said it, IMPRESS. If you want to impress, use markers. There is no turning back when you use markers. You have to be precise and confident to pull off a nice drawing live in front of an audience. I will tell you the secret because I don't like bullshitting when it comes to "IMPRESSING" people -- art is what artists spend hundreds of hours on, so they better be good at it. It's their job, so if they mess up especially on drawing the hands and feet, don't expect compliments from me. I don't get impressed by an artist who draws a big rock in the foreground to cover up the feet or does a lot of rendering, which is oftentimes done to hide mistakes. 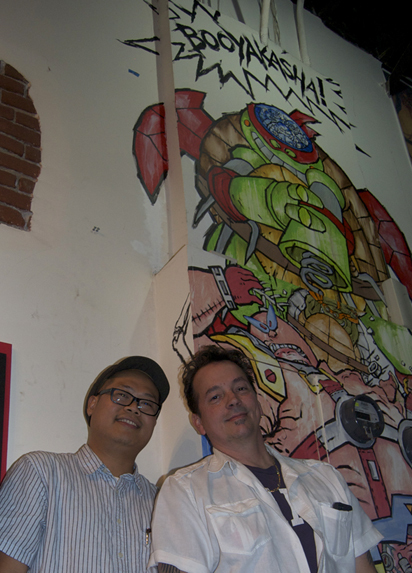 Espen: And that Turtles sketch made Eastman ask if you wanted to do a mural at Meltdown comics, right? Why don't you walk us through the design of that piece, and a little about how you, Arman and Franz DG worked as a team on the mural. 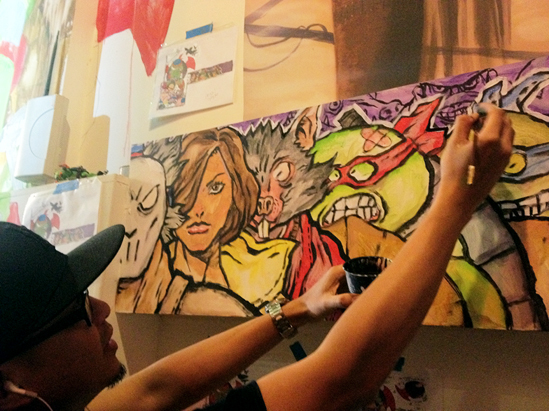 Riko: Well after Kevin Eastman saw my stuff, he asked me if I wanted to do three big panels for his exhibit. Of course being a fanboy I was blown away when he said, "You're hired," and gave his personal contact number. There are tons on good artists hanging around in that exhibit and somehow I got his attention. Maybe he felt sorry for me or maybe he found me annoying. But yeah, originally it was supposed to be a solo freestyle. I was also toying with the idea of asking Kevin if we could do a collaboration, but he got sick and couldn't get up for a day or two so I didn't want to push it. I also didn't want to end up not finishing the three panels, so I asked my brother Arman and Franz to help me do a mural I designed that was approved by Kevin himself via email. It was a fun project. I think it took us about nine hours or so to finish if I don't count the time we spent talking and eating in between. Basically, it's like a big coloring book. I sketched the lines on pencil and from there we started painting the piece. When everything is colored, I painted the final black outline for consistency of the style. We used the same method I use when I do murals. Kevin treated us with hospitality. Espen: So, anything you haven't done yet that you want to try? Riko: I haven't tried to be a sell out yet. Maybe I can try that, hehehe. Graffiti art is very popular right now but I don't want to jump on the trend. I think I will stick to my guns. Art always has its successful bandwagons. If he can do it, I can do it too, mentally, but in the end it is not going to be the same or as genuine as it was intended to be. I was playing with the idea of doing graffiti art in the middle of a busy highway. You know dodging the fast cars and trucks and running back and forth to finish a piece right in the middle of the road. Now, that's original and risky. Just an idea… DON'T do it okay, unless you have nine lives. Seriously, what I'd like is to produce a whole comic book with you and get it published and to work with anybody who wants to work with me towards publication, as long as I get respect and equal rights.